So-called English "cozy mysteries" are a wildly successful subset of the whodunnit genre, in part because of Agatha Christie, who was a master of getting a bunch of people together in a house and then bumping them off one by one. 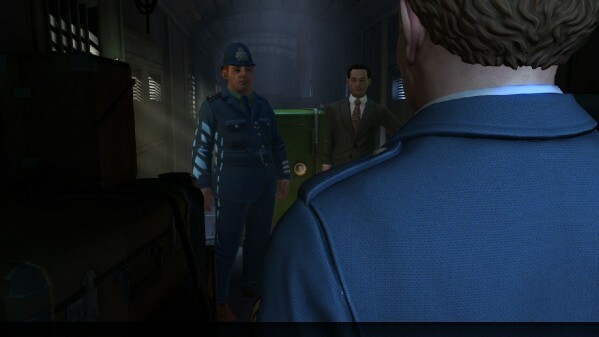 The Raven: Legacy of a Master Thief takes its story cues right from Dame Agatha, drawing together a disparate group of characters and then promptly dropping a mysterious jewel thief into their midst. Deception, red herrings, and clues abound, and putting it all right is a joyous activity for the armchair sleuth – if only the game's clunky execution didn't keep getting in the way. As Constable Anton Zellner, you're an endearing, if not overly successful cop with a penchant for mysteries. In Part 1 of The Raven, the only part currently available, you find yourself accidentally at the center of a mystery when you discover that the acclaimed thief The Raven has his sights on a jewel locked up a few train cars behind you. The Inspector in charge of the guard detail isn't really interested in your help, but that's just because he doesn't see your full potential. Surely if you poke around a bit you can find out something really vital for catching the criminal in the act! Your investigation follows typical adventure game formula as you fill your pockets with bric-a-brac in the hopes of solving artificially over-complicated conundrums. It really shouldn't be such a big deal to help the flustered professor who got locked out of his room, but this is an adventure game, people. Steps must be taken. Many steps, back and forth, opening drawers, asking people the same questions over and over, and picking up everything that isn't nailed down. Repetitious though the formula may be, the writing and voice acting in The Raven are exceptionally good, no matter how minor the character. Zellner in particular puts such nuance into his delivery that you'll understand more about him from his tone of voice than from any background details he lets slip during conversation. He's not only bursting to be involved with a real honest-to-god mystery that could've jumped off the pages of one of his favorite books, but he's also eager to prove to the world – and himself – that he's as good a cop as he believes himself to be. You'll want him to succeed not just because that's the win state for the game, but also because he's a nice guy who deserves a break. The Raven keeps its mystery smart and tight, confining you to few small locations, forcing you to really think about the task before you, rather than just having you roam around combining every item with every other item in the hopes that you'll accidentally solve the puzzle. This claustrophobic approach means you'll be retracing your steps a lot, but peeling back layers of puzzles will reveal new conversational options and items. Having a conversation with the same person five times is far more enjoyable when each conversation yields new info – some of it relevant, some meant only to distract. It's a well-crafted mystery that will certainly encourage you to exercise the little gray cells. Unfortunately, there's just a bit too much delay between the spark of inspiration and your ability to actually do anything about it. Everything about the movement of The Raven feels sluggish; Zellner moseys at a somnambulant pace, oftentimes spinning around in circles before opening whatever door you've asked him to breach. Even the inventory bar seems reluctant to rise from the bottom of your screen when summoned. It sulkily does its duty, as do the character animations, which often pause, as though in deep thought, before moving on to the next action. The Raven's ponderous presentation doesn't ruin the gameplay, but it tries awfully hard to put a damper on the excitement of investigation. The thrill of discovering an item's true use is reduced to a low-level hum by the time you actually get to use it. The Raven: Legacy of a Master Thief has everything you want from this kind of cozy mystery: a high-stakes crime, over-the-top suspects and a plucky everyman sleuth. The story and acting are pitch-perfect and will engage even the fussiest armchair detectives, so long as they can put up with the game's mechanical shortcomings. This review is based a PC download The Raven: Legacy of a Master Thief, purchased by the reviewer. It is also available on Mac and Linux. Xbox 360 and PlayStation 3 versions are expected later this summer.